"We are all angels. It is what we do with our wings that separates us." I have seen many films that pummel the viewer with bizarre images and introspective themes merely for the sake of eliciting controversy. Quite honestly, these types of films appall me. If a film does not possess a strong enough narrative to impress me during my initial viewing, why would I want to spend time discussing it, much less, sit through a repeat viewing in an attempt to unravel secrets that I never found intriguing the first time around? Northfork is filled with such images and themes, yet I was so enthralled and mesmerized by the surreal experience unfolding before me that I wanted nothing more than to experience the film again and discover pieces of the puzzle that I might have missed. While I may ultimately discover that there are no straightforward answers to the riddles of Northfork, this is one piece of art that actually proves more enchanting with the more questions it raises. The year is 1955. The location is the small town of Northfork, Montana, which is about to be flooded by the waters of a newly constructed hydroelectric dam. Most of the townspeople have evacuated, moved on to "higher ground", but a few stubborn residents remain. The task of relocating these stragglers belongs to a group of mysterious men in black known as the Evacuation Team. Those who still reside in Northfork include a religious fanatic, who has built an ark, and his two wives; a tender soft-spoken minister and the sickly child he cares for, whose ailing state has led him to believe he is an angel. As the story unfolds, we get a glimpse at the nature in which these lives intertwine, each soul dealing with transition in their own unique way. Whether or not this plot sounds interesting is nearly irrelevant, as it is mostly a fa�ade for what is truly beneath the surface. There could be many theories as to what Northfork is actually about, yet none of these theories would necessarily be right or wrong. Much of the brilliance in the ambiguous style by creators Michael and Mark Polish is that the story holds narrative ground while still leaving plenty of room for interpretation. Northfork uses a remarkable visual style along with wonderful melancholy performances to explore themes of loss, acceptance, and the afterlife. With their surreal, dreamlike style, the Polish brothers have created a film that taps deeply into the viewers' subconscious. What any one viewer sees in Northfork is largely dependent on his or her own personal beliefs. With the exception of a few failed attempts at humor, Northfork is a riveting tour-de-force. It is a nearly indescribable film, filled with so many introspective themes and metaphors, that the only way to truly describe it is to bear witness to it. Many viewers will find it unbearably slow, and others may even find themselves angry at its unconventionality. However, this is a film that must be watched with different eyes and a different mind set than what is required when watching typical mind-numbing Hollywood output. It is rare that a motion picture offers such an interactive experience, allowing the viewer to create his or her own interpretation of the film rather than the filmmakers merely feeding their own interpretation to the audience. It is even more rare that it is executed with such admirable results. Image Transfer Review: The dismal cinematography of Northfork shines through in this 2.35:1 anamorphic widescreen image transfer. The Polish brothers have created a subdued color palette, desaturating the image until it nearly looked black-and-white. While some may regard this as a fault of the transfer, the image is clearly representative of the filmmakers' intentions. The overall aesthetic of the transfer is clean and smooth with few visible deficiencies. Even during the many scenes with highly contrast images the picture rarely falters, and edge enhancement is minimal. Aside from a few instances where the image flickers unnaturally, this is a first-rate transfer. Audio Transfer Review: The Dolby Digital 5.1 soundtrack is extremely subtle, rarely extending above whisper quiet volume levels. This is not to say, however, that the format has not been fully utilized. The soundstage is fully engulfing, placing dialogue front and center while wind gently blows through the surround channels. Fidelity is outstanding throughout, with sweeping music passages and clean, intelligible dialogue. While certainly nothing aggressive, this soundtrack is nicely balanced and suits the film admirably. Extras Review: We begin with a feature length audio commentary by Michael and Mark Polish. The brothers have quite a laid back speaking manner, and their identical voices makes it near impossible to tell them apart from one another. Nevertheless, they provide an excellent elaboration on their film, discussing topics that I did not necessarily expect to hear, such as the subtle use of sounds. While no big secrets of Northfork are revealed, the Polish brothers shed light on many important elements of the story without revealing any definitive answers. I truly appreciated their careful disclosure so as to enlighten me while not detracting from my own viewpoints. Bare-Knuckle Filmmaking: The Construction of Northfork is a revealing 35-minute documentary divided into seven sections. While somewhat routine, much of the documentary is structured in an enigmatic method similar to that seen in the film. Those who appreciate Northfork will most likely find this documentary a worthwhile companion piece to the film. Next, is a brief photo gallery. While I do not typically care for these features, this is one of the better galleries I have seen, filled with beautifully haunting black-and-white images. 24-Frame News Segment: Northfork is a brief Sundance Channel featurette that focuses on the importance of location. Filmed in their homeland of Montana, the Polish brothers have essentially turned these barren landscapes into a major character of their film. While extremely short, I found the four and a half minute running time to be adequate for this feature. Rounding out the special features is the Northfork theatrical trailer. It is a lengthy and engrossing montage of clips presented in nonanamorphic widescreen with 5.1 sound. My favorite films are those that leave long lasting impressions, continuing to dazzle and inspire me even after multiple viewings. Northfork is such a film, filled with haunting images and themes that resonated in my mind long after my initial viewing had ended. Northfork may not be everybody's "cup of tea," but those who crave mystical, thought-provoking entertainment will undoubtedly find themselves enthralled by this allegorical masterpiece. 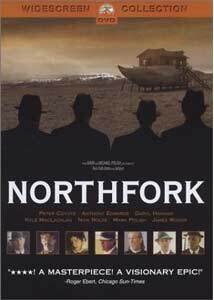 I regard Northfork as one of the best films of 2003.